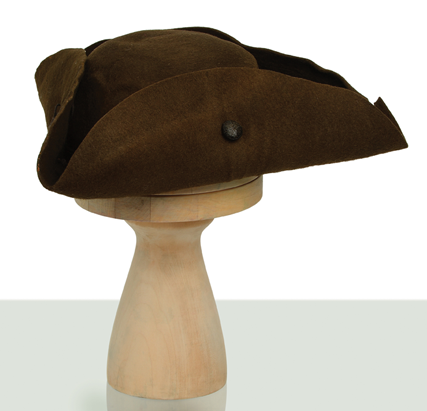 This hat dates from the early 18th century. It is a brown felt hat with a low crown and a wide brim complete with horsehair button. The shape and flexibility of the material allows the style to be adapted depending on preference. It was discovered in the 1960’s by Mr. Eddie Roe, a shipwreck enthusiast and an indefatigable researcher. He recovered numerous artefacts from a selection of Kerry shipwrecks. On his death in 2009, his collection of artefacts was donated by his brother Mr. Joseph Roe. The shipwreck from which the hat was recovered most likely dates from circa 1725-1750. The identity of the ship is unknown, though primary contenders are the Golden Lion (1730) and the Wind Trader (1746).